I was talking with a coworker who had a particular design problem. 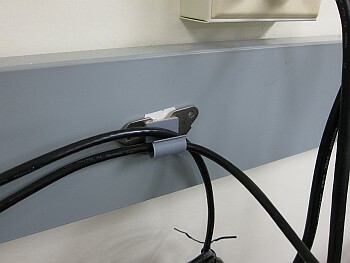 Her network jack was embedded in a counter and the cable ran all the way across a built-in drawer to her desk and would frequently get jammed in the drawer. 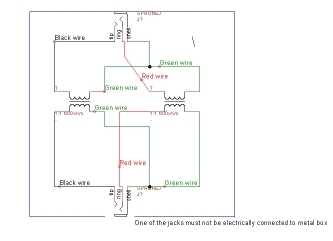 I suggested to her to talk to the Facilities guys to get some sort of cable management installed (as that's not my bailiwick) but I knew that the problem would persist into the future. I also thought there was little place to install anything that required a drilled hole, as there was AC conduit and such in the area. Then I had an inspiration: the network jack had been installed in a flat steel conduit. And I had a lot of hard drive magnets. So a little hot glue, some adhesive cable holders (that never really held very well), and I've got a solution! 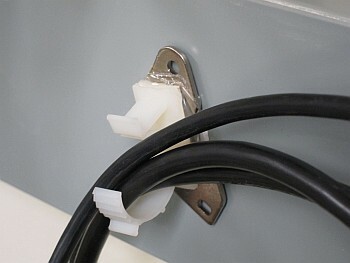 And now I'm making a bunch more for better cable management in my server room. I stuck a paper sticker on the magnet side to help prevent some of the surface marring these magnets can produce; a felt would probably be a better material. My long-suffering Geiger counter is now back up and running. Now, as has been pointed out, this particular instance of this experiment is really an experiment, and is run only by me, for only experimental purposes. It doesn't represent any opinion or endorsement or opinion of any entity, whether the University of Chicago Library or the University or anything else. It is not a service. It represents nothing, is not calibrated, and should not be relied upon by anyone for anything. Don't email or call anyone but myself about it. This instance is located in my office on the A-level of the Regenstein Library, the first basement level of a six-story building. The levels average about 8 microrads/hr here. Outside at Ryerson Physical Laboratory on the fifth floor, levels average to about 12 microrads/hr, which indicate the shielding provided by the Regenstein against the cosmic ray flux. The problem I've been having with this counter was with the associated AW-SRAD software, which runs under DOS, doesn't appear to support virtual COM ports above COM4. On my Windows XP PC I had installed an Arduino which offered a similar USB Serial converter and I theorize at some point there was a conflict and the Geiger counter with its FTDI USB to serial converter took a high COM port at COM5. After removing the Arduino, I then disabled the real serial port at COM1 and forced via Device Manager->Ports->USB Serial Ports the port to go to COM1. I've hesitated to comment much on the ongoing Japanese tragedy, but I wish to talk a little about the output coming out from the reactor whenever they open the valves to reduce the pressure inside. In commerical nuclear reactors not using heavy-water for their coolant (aka most non-Canadian western reactors) the pure water coolant is exposed to the intense neutron flux as it passes through the reactor. The neutrons can interact with the oxygen nuclei in the water to form nitrogen-16, a very short lived radioisotope with a half-life of seven seconds. After a few minutes away from the core there is none of it left so the only hazard is near the output pipe, and there are places they store the output for just a little while to let all of the N-16 to decay back into oxygen-16. The other common isotope coming out is tritium coming from the small amount of deuterium in normal water, leaking through the fuel rod cladding, and other spalling type nuclear reactions in the materials in the core. The tritium is a low radioactive hazard but has a 12-year half-life. If the reactor is hot, water will decompose into hydrogen and oxygen, especially with the right catalysts. So if you were to open the output valve on a reactor to relive the steam pressure inside (because the regular cooling is not working), you would get quite a bit of that nitrogen-16. It would be gone by the time a few minutes of wind-time, but it is quite the hazard to the plant. I wonder how much of the periodic bursts of site limit radioactivity is related to that. The introduction of seawater into the cores introduces the possibility of neutron activation of a number of other elements (sodium, chlorine, etc.) into radioactive isotopes that last longer and can have more of an issue in life time and clean up. None of this discussion is about the breaking or melting of the cladding and detection of fission products (like what you see when checking people on their clothing for particles), which seems to have occurred in some fashion. A good primer on what might be going on, without hysteria is over at MIT. 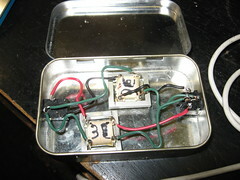 Two years I made an audio stereo isolation transformer, suitable for getting rid of ground loop problems in a line-level audio connection. 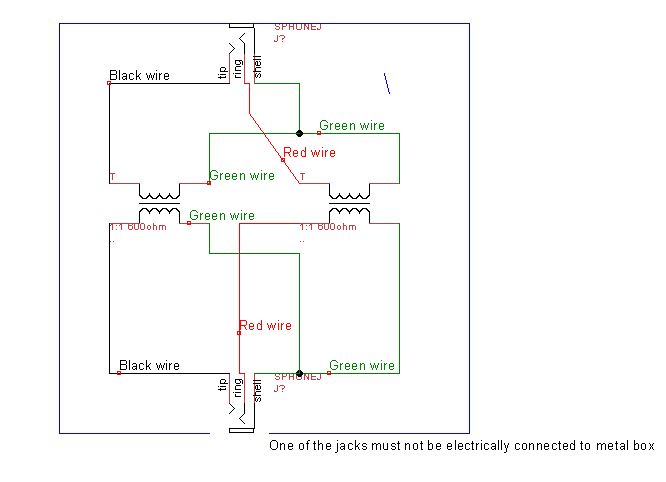 Here's a simple circuit diagram that attempts to match the colors of the physical device.